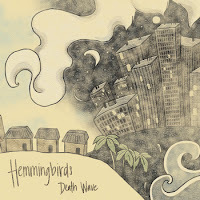 Don't be fooled by the album title; you won't hear anything in the realm of doom metal coming out of your speakers when you play Death Wave, the debut LP from Chicago's Hemmingbirds. What you will hear is some extremely well-crafted indie rock packed with a serious amount of feeling - sometimes uplifting, sometimes darkly desperate and most often a powerful mixture of both. Currently a quintet, Hemmingbirds began in late 2009 as a solo project of frontman Yoo Soo Kim. In the project's early stages Yoo Soo recorded Death Wave with only the help of drummer Zack Benkowski, which seems particularly impressive when taking in the full, driving sound of the record. The gentle, brief "The New Age" starts things off, introducing the album with just a few lines about leaving the past behind and moving forward. Most of what follows takes a livelier approach, but never loses any emotional impact. Mid-album track "Perpetuator" is a prime example of Hemmingbirds at their most affecting. It's one of the LP's most ear-catching moments, and an aptly-named considering its sense of desperation and urgency as well as the nervous-sounding guitar work throughout. The lyrics follow suit, with Yoo Soo singing "Help me God / I think you're just a thought and I don't know what to believe in" as the track comes to a close. The bittersweet "In the Event of Failure" is another of the album's most poignant tracks, beginning with only acoustic guitar, vocals and the grabbing lyrics, "Brother, we're standing at the edge of buildings." As it goes on it builds into a fuller sound with a memorable, sadly beautiful melody. Later, the dark "Slippery Slope" creeps in unassumingly before bursting out in a noisy storm and finally slinking its way out. While these tracks are some of Death Wave's strongest, Hemmingbirds wisely provide some lighter moments to balance out the sound. The jaunty melody and handclaps of "Treetops" and the peppy optimism of rocker "Resolutions," for example, come on like a bit of sunshine breaking through the clouds. All of the album's emotions culminate on the slow-burning "Death Wave/Color Swirls." We're left feeling both somber and hopeful. By the time the last note has played, the Death Wave moniker has begun to make quite a bit of sense. There's an encompassing sense of loss throughout the record, but also one of starting again; they are feelings Hemmingbirds convey so powerfully in their strongest moments that you can't help but be consumed. Death Wave is available directly from Hemmingbirds via Bandcamp. And if you don't want to get out of the holiday spirit just yet, also check out the band's recent free, four-track Christmas release, Carol of the Birds. For the live experience, mark these dates on your calendar: January 11 at Martyr's, January 21 at the Red Herring (in Urbana) and February 15 at Double Door. We've only read great things about this band and from the music we've heard, they rock. We wanted to head out to Martyr's tonight but Ivan got the flu and is currently coughing up a lung in the living room. Still, we're super excited to be sharing the stage with Hemmingbirds at Double Door in February!